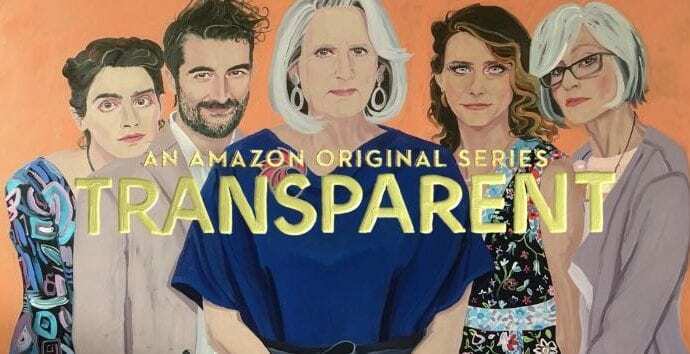 Continuing its work of social critique through mass-mediated artistic expression, Jill Soloway’s Transparent once again delivers advocacy, humor, and somber wit in a third season on Amazon.com’s Prime subscription service. As showrunner, Soloway depicts experiences and identities that infrequently rise to the surface of U.S. televisual culture, and extends patterns developed through two earlier seasons. In this most recent iteration, released during September 2016, Transparent deepens its engagement with questions of identity and belonging, and establishes connections between the identity explorations of both its transgender and cisgender characters. Soloway underscores these links with especial impact through manipulations of her characters’ variable adherence to Judaism and their affiliations with the program’s central family grouping, the Pfeffermans. In its first season, Transparent introduced characters and premises; in its second, the show differentiated individual problems and trajectories among the Pfeffermans. As I wrote previously, in season two, Soloway put ritual to work in representing those individualizations. Through the new release, Soloway reveals her characters struggling to find and integrate identity in the now-familiar bit still fluid contours of their family structure. In the season’s ten episodes, Jewish ritual persists as a central narrative vehicle. But Soloway expands her representations of religious practices as wider forms through which to articulate and advance characterization. Religious practices begin to stand in for and overlap other practices of identity and belonging. And through them, the Pfeffermans and their community resist and reconfigure normative expectations for selfhood. José Esteban Muñoz, a theorist of queer performance studies, developed a concept of “disidentification” that helps to describe the representational work of identity resistance and reconfiguration that Soloway accomplishes in season three. In his book Disidentifications: Queers of Color and the Performance of Politics, Muñoz uses disidentification as a tool to describe the symbolic and practical effects of works presented by LGBT* performance artists. For Muñoz, these artists uncover and display “world[s] where queer lives, politics, and possibilities are representable in their complexity.” By representing the disconnection between identity as experienced by queer people and identity as demanded by society, performances create space for self-assertions of legitimacy. In this way, disidentification refers to the politically engaged work of resisting and reconfiguring selfhood through artistic performances. Art provides strategies for changing politics by depicting identity in ways that reject exclusionary norms. Disidentification describes the tension that links normativity to oppression, and, at the site of this link, creates an affirmative identity. Performance culture among drag queens illustrates this link. One example, RuPaul’s Drag Race, broadcast through cable television, represents a range of subcultural expressions of female impersonation that are most often performed by gay men. Through highly stylized representations of femininity—especially in the artistic forms of lip sync and fashion styling—Drag Race’s queer performers exaggerate normative symbols of femaleness, thereby calling into question the perceived stability of gender identity itself. If “men” can produce the appearance of authentic “womanhood,” then to what essential markers of identity do “male” and “female” refer at all? Drag Race’s gay men disidentify with heteronormative maleness by reconfiguring masculinity behind hairspray, mascara, sequins, and pop music. Through the art of drag performance, they create new spaces in which to articulate more fluid representations of their self-identities beyond the stage. Neither mere protest nor pure invention, by resisting, disidentification reconfigures what already exists. Exploiting this representational strategy, Transparent’s characters enact performances of religious practices staged as performances of disidentification. They use normative expressions of gender and Judaism to critique those norms and establish new terms for identity. At the close of the third season, for instance, the show’s central protagonist, Maura Pfefferman (played by Jeffrey Tambor) improvises a ritual of gender affirmation and body acceptance. A transgender woman whose experience of coming out furnished the series’ initial premise, Maura has learned that she cannot undergo gender affirmation surgery due to health complications. While vacationing with her family on a cruise ship, she has decided to relinquish the garments she wore to modify her body’s appearance. Maura stands at the ship’s rail, facing open ocean, when her child Ali approaches and comments on Maura’s new athleisure outfit, purchased for its unisex design. Gesturing to a garment to be discarded, Maura explains, “I’m just saying goodbye to my Spand-X and my feminine shapewear. This one has my tuchus in it.” Further explaining her inability to pursue surgery, Maura expresses her resolution of disappointment through self-acceptance: “I’ve already transitioned. I’m trans. I’m just…this is me. This is it.” Ali then ritualizes the moment, asking if they can recite a prayer. “Do it,” Maura answers. The improvised performance concludes with the two exclaiming in unison, “set us free.” Their recitation of formulaic language and configuration of bodily poses refers to no specific practice from traditional Jewish ritual culture. Instead, Ali and Maura assemble a pastiche of ritual elements, inventing an ad hoc religious performance that addresses Maura’s womanhood and acknowledges their family’s identification with Judaism. References to Passover (“Dayenu!”) and to feminist theology cross the ritual wires of identity for Ali and Maura, and open a space for disidentification with normative femininity and traditional Judaism. By resisting norms, the parent-and-child pair reconfigure their self-understandings as Jewish women. More than this, Transparent elevates disidentificatory performances from the “subcultural circuits” where Muñoz discovers them. Soloway’s episodes make disidentification available to mainstream culture through examples of everyday experiences streamed through the web (although limited by subscription). Transparent’s characters—whether queer or straight, trans or cis—all modify the socially prescribed terms of their identities. By implementing the cultural pedagogy described by Muñoz, Soloway aids in reprogramming culture by rendering trans*, lesbian, bisexual, feminist and other non-normative identities in close proximity to normative experiences. Midway through the season, for instance, Maura’s child Josh—portrayed as a heterosexual, cisgender male—undergoes a crisis of religious affiliation and temporarily converts to Christianity in order to strengthen the bond with his own estranged son. Through this plot element, Soloway depicts Josh’s religious performances of identity on equal terms with Maura’s. In Transparent, normative and non-normative identities all find expression through disidentification. Through its representations of religious practices and their modification, the most recent episodes of Transparent convey impactful disidentifications that question the stability of all forms of identity, especially those rooted in religion, gender, and sexuality. In the program’s depictions of multidimensional queerness, religious practices function as resistant representations of identity while they simultaneously open spaces for characters to reconfigure their senses of selfhood. You wake up with two words emblazoned on your chest; it’s time. You’re gonna make a break for freedom, you will not be a slave any more. You get out of bed. You grab your things. You run outside. And then there you are, free. The first light of day. Behind you is your past, everything you came from, everything that you thought you knew. You start running. As you run, you listen for the voice of the divine, but you hear nothing. So you stop and you listen closer. What is that? Is it nothing? No. It is stillness. While Raquel recites these words, the scene shifts visually. Moving from the setting of synagogue interior to an exterior garden scene, Raquel appears in the same clothing, now alternating between a seated position writing in a notebook on a bench, and wandering through a thicket of bamboo. Her spoken words and costume provide continuity between the intercut scenes. And Soloway has announced the season’s core theme: quests for new beginnings and personal freedom. Raquel’s sermon, spoken onstage in improvisational posture, evokes notions of performance and rehearsal as foundational elements of institutional religious practice. Sermons don’t just happen; they are drafted, revised, vocalized, and gestured. The garden scene, by contrast, presents performative action that expresses individual contemplation through meditative writing and movement. Raquel’s rehearsal for the public performance of a sermon and her practice of individual contemplation both work to articulate her sense of identity. Soloway’s sound design shifts the symbolism of this brief scene towards the articulation of identity, and initiates a profound reflection on the role played by religious practices in constructing and articulating selfhood. Mixed behind Raquel’s voiceover sermon, Nina Simone’s recording of the song “Ne Me Quitte Pas” plays in background. “Don’t leave me,” cries the song’s titular line. The quality of Simone’s voice and the content of her words call attention to Raquel’s motivation. Not only does she seek to guide her congregation in contemplation of Passover’s themes of release from suffering and discovery of liberation, but Raquel’s words are also self-directed. As Soloway reveals in later episodes, Raquel is struggling to harmonize her sense of womanhood with her role as a religious leader in progressive Judaism, and wrestles with the place of sexual desire and spiritual experimentation in the work of maintaining Jewish traditions. The multiple performances of Raquel’s Passover homily allow her to resist and reconfigure Judaism as she resists and reconfigures her unfolding sense of self-identity. The desire not to be left alone tugs at the anxious possibility of finding her identity marked as illegitimate or undesirable. By lifting up this conflict in Raquel’s character, Soloway begins the work of representing disidentity through resistance against normative constructs of Judaism, femaleness, and heterosexuality. Raquel carries traces of her publicly performed Judaism and her individually practiced meditation back and forth between one another, re-figuring each in relation to the other. Soloway accomplishes this representational work in the episode’s first minute, and the opening titles immediately follow. As such, Raquel’s performance functions as the narrative pretext for the representations of disidentity disclosed through the remainder of the episode and season. The episode continues after the credits with Maura’s morning routine. Through the first and second seasons, Maura has secured acceptance from her family and stitched herself into a small community of fellow transfolk. Undertaking the beginning of a new day with fresh clothes and a full cup of tea, she engages in polite tableside conversation with her trans* housemate over breakfast. Reflecting on family relationships and her new role as a volunteer at the Los Angeles LGBT Center, Maura observes: “I’ve got everything I need. So, why am I so unhappy?” Soloway presents a narrative opening through which to continue the development of Maura’s emerging identity. Cutting to the offices of the community center’s trans* crisis help-line, the episode initiates its principal action with Maura’s answer of a call from a trans* person named Elizah, who mentions their contemplation of suicide. Stumbling through a boilerplate script, Maura connects with Elizah by expressing her shared identification as trans*, and calming Elizah with a shared breathing exercise. After establishing what seems to be an authentic emotional link, Elizah abruptly ends the call and Maura panics. 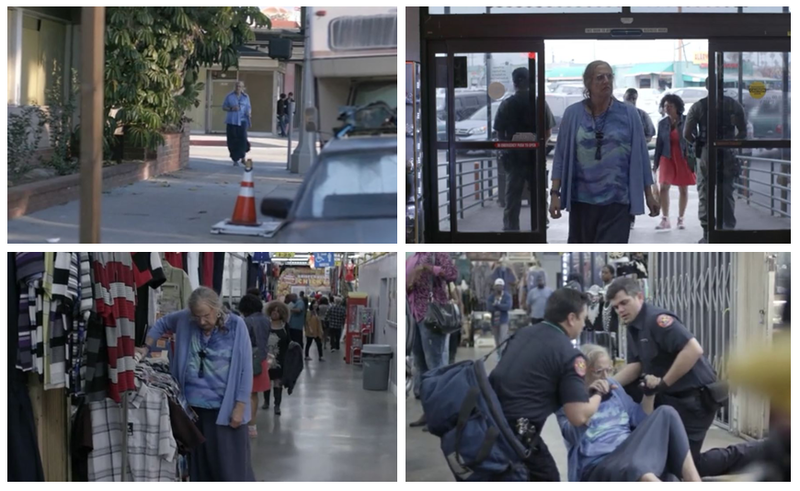 In desperation, Maura leaves the call center in search of Elizah, who had mentioned that they were in the waiting room of St. Christopher’s Medical Clinic in South Los Angeles. In Elizah’s experience as a trans* person, the quotidian experience of waiting for a medical appointment had become an experience of rupture, of disidentification with a normative construct of medical care. It seems that, rather than a space of healing, the clinic became a space of trauma to be resolved either through a search for solidarity or through flight and escape. The solidarity of a help-line call proved too insubstantial, and Elizah opted for flight. As Maura arrives at the South L.A. clinic, she learns that Elizah has departed, heading to the nearby Slauson Swap Meet, and Maura follows. In her swap-meet search, Maura discovers her incongruence with Elizah’s context and is forced to confront the vulnerability of her own position as a transgender person. While seeking Elizah from storefront to storefront, Maura stumbles over her own unrecognized white privilege. She misperceives the racial and class connotations of an interaction with a group of trans* Latinx women. She disregards the instructions of an African-American clerk who scolds her after she is unable to pay for a bottled drink, but takes it anyway. These encounters combine with Maura’s anxiety in searching for Elizah and overwhelm her. Collapsing, either from the intensity of her concern for Elizah or from wafts of toxic fumes drifting from a nearby nail salon, Maura succumbs to stress and faints. While paramedics help Maura onto a gurney, Simone’s “Ne Me Quitte Pas” resumes in background. The medics explain to Maura that they must transport her to the nearest hospital, Los Angeles County–USC Medical Center. Once again confronting the dissonance between perceived and experienced identity, Maura resists being treated at a public hospital: “You have to take me to Cedars Sinai. I’m Jewish. My name is Pfefferman. You understand? Pfefferman.” The religious, economic, and racial implications of Maura’s plea evoke Simone’s call not to be left; they articulate the anxiety felt in the potential for abandonment and denunciation. As the episode draws to a close, Raquel’s sermon also resumes in voiceover: “You’re waiting for a miracle, you’re waiting for the sea to part. Well, that’s an old miracle. So what about this? What if the miracle was you? What if you had to be your own messiah? Then what?” This finding of messiahship in oneself surfaces as a prominent meditation for the entire third season. Raquel inverts the traditional understanding that messiah will arrive from outside to protect and save what is inside. The reconfiguration of miracle is the reconfiguration of self. By reprising Raquel’s sermon and Simone’s song during Maura’s crisis, Soloway establishes direct links between the religious practices of sermon preparation and individual meditation, and the experiences of trauma and solidarity that trans* people undergo in the conduct of social life. Through the duration of the episodes that follow, Maura will learn strategies for self-preservation and self-articulation, just as Raquel struggles to integrate her senses of gender, spirituality, and sexuality with her position in Judaism. Soloway’s characters each improvise complex individual and collective identities through practices of resistance and reconfiguration that open spaces for their distinct understandings of selfhood. Through their manufacture and improvisation, religious practices of disidentification work both to resist and reconstruct identity when formulaic or traditional elements are made to vary. Through their disidentificatory performances, the Pfeffermans and those close to them build strategies to cope with the queerness of dislocation, as individuals and as a family. In this, Soloway’s characters once again open new angles of vision on dissonant experiences of identity and sociality through their cries not to be left alone in a complicated twenty-first-century world.